Do you have a Yoga Wheel or been wanting to try one and would like to learn the different ways you can use it in your yoga practice and how it can help you? 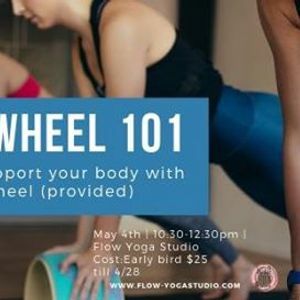 Come and join Lisa and Kristen of Wild Soul Yoga in learning all the ways you can use the Yoga Wheel to stretch, strengthen, tone your muscles and even move and flow with it. The Yoga Wheel can be used as an athletic stretching and recovery tool. The wheel is awesome for gaining more flexibility in your spine, hips, and shoulders. It is great for core work and for strengthening all the major muscle groups. The yoga wheel is like yin for your spine, physical therapy and a massage all in one! We will also explore some additional creative ways to use the wheel to help other tight areas of the body and assist you in exploring optional intermediate and advanced poses. You will also learn safety precautions to have an all around knowledge on how to use this great athletic tool. No wheel? No worries! We will have yoga wheels for your use and they will be available for purchase after class if you find you can’t part with your wheel. Come and join us for this therapeutic, yet fun workshop! Want to take a new Yoga Wheel home?